You’re invited to join art librarians from around the world in Chicago this summer! The IFLA World Library and Information Congress is meeting in Columbus, Ohio this summer. The Art Libraries Satellite Section Meeting will be held in Chicago, Illinois, immediately before the Columbus conference. 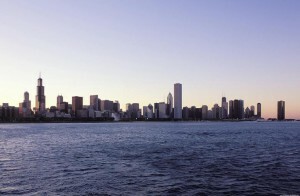 Distant View of Chicago from Lake Michigan. Image courtesy of Scott Gilchrist, Archivision, Inc. The Art Libraries Section of IFLA, in collaboration with the University of Notre Dame and the Midstates and Ohio Valley Chapters of ARLIS/NA, is organizing a three-day conference in Chicago that will focus on modern and historic art library facilities. The Art Library as Place: Building on the Past, Building for the Future will consist of papers, panel discussions, site visits to local art museums and libraries, and tours of Chicago area architecture. Sponsors for the conference include the Art Institute of Chicago, the Hesburgh Libraries of Notre Dame, ARLIS/NA, ARLIS/NA Midstates Chapter, and the ARLIS/NA Ohio Valley Chapter.